We have four amazing bar and color bumper plate packages to meet the budget and needs of any lifter out there! Have questions or want to change it up a bit? Call us at 512-201-4404 and we will get you set up and shipped out within 24 hours! Bomba Bars are American-made with very high quality steel for a top notch bar. Premium grade bushings give the Bomba bars a buttery smooth spin. Color Bumper Plates by Fringe Sport are extremely durable and will last for years in a garage or affiliate. Our bumper plates are made from a low-bounce rubber and hold up the abuse. Weight Tolerance +/- 10 grams of declared weight. These color coded bumpers make differentiating weights fast and easy..
Bottom line: These barbell and plates are an unbeatable combination. Completely customizable! Shoot us an email or phone call to get a different combination! Our Wonder Bar is a great bar at a great price and is considered best for an entry-level athlete. The best box bar. Seasoned athlete or affiliate owner, you may want to consider the Bomba Bar V2 or even the Olympic Weightlifting Bar. The Bomba Bar is the best value American-made all-around training barbell you can get. Our Olympic Weightlifting Bars are the premiere training barbells for aspiring Olympians. The Wonder Bar, Bomba Bar V2, and Olympic Weightlift Bar all come in a 20kg for men and 15kg for women. Women's hands tend to be smaller than a mans, so the "women's" bar features a 25mm shaft diameter vs. the "men's" 20kg and 28-32mm shaft. Wonder Barbell (Bushing): This wonder bar is perfect for any garage gymer. This bar represents the result of several years of using every bar on the market, plus years of selling Oly bars at FringeSport. We've taken everything we know about bars and delivered a competitively priced entry-level bar that has a ton going for it. Best Use: Garage Gym or WODing. Typically used for heavy or slow lifts, such as powerlifting movements. Bomba V2 Barbell (Bushing): This is the best value American-made all-around training barbell you can get. After selling thousands of Bomba Bars, we've listened to the customer feedback and incorporated it in the V2. Best Use: Garage Gym or WODing. Olympic lifting. Typically used for heavy or slow lifts, such as powerlifting movements. 10/25/45 - 160lbs: These are all the weights that you will need to get in Olympic lifting with bumper plates. Use the 10s to help with technique to start, and then as you get stronger you can move up to the 25s and 45s and really start pounding the ground with those weights. Traditional iron weights can be used to supplement this set if you need more weight. 10/15/25/45 - 190lbs: For those that want to make their weight jumps a little smaller and want some additional rubber to add to the bars. The 15s by themselves are still mainly for technique, but their added weight definitely makes them sturdier than the 10 lb bumpers. 10/15/25/35/45 - 260lbs: This 260 pound full set of Fringe Sport bumper plates is a must for the well-stocked home gym. This set comes with 5 pairs of full color rubber bumper plates- one set comes with a pair each of 10 pound, 15 pound, 25 pound, 35 pound, and 45 pound plates. 10/15/25/45/45/45 - 370lbs: This 370 pound set of Fringe Sport bumper plates ensures that all your bases are covered, for 1 or two people. Whether you are a novice lifter or throwing around some real weight, this set has the weights you need. Need to go heavier? You can either add iron in or contact us for a custom quote on a larger package. 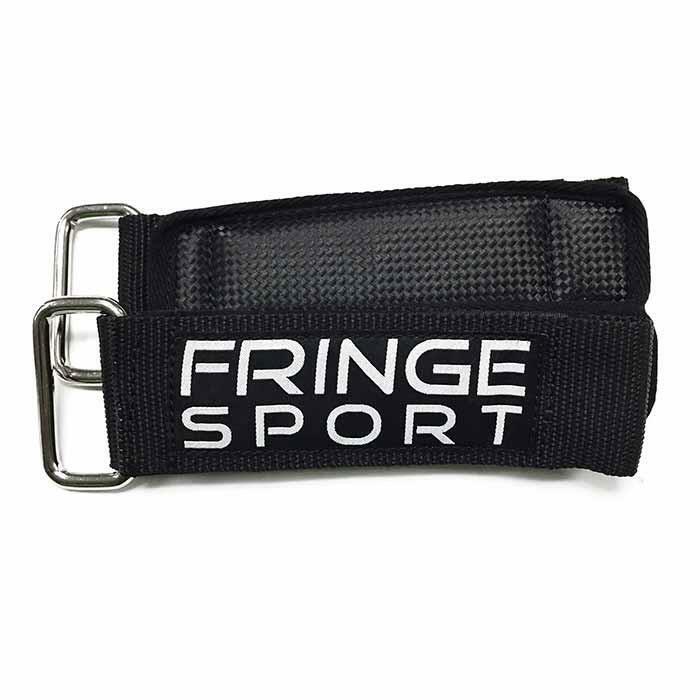 Color Bumper Plate Set by Fringe Sport: We included our premium Fringe Sport color bumper plates. The are color coded to the IWF standard. They are low bounce, compiled of a unique blend of high density virgin rubber, incorporate a rock solid steel insert, and sport a slightly lesser plate width than that of other bumpers on the market (except 10's and 15's) to insure long lasting performance as well as provide more loadable space on the barbell sleeve. Bumper Plate Widths: 55's - 3.25", 45's - 2.9", 35's - 2.35", 25's - 1.87", 15's - 1.2", 10's - 1.05"
Durometer: 10's and 15's are 90 sHA; the 25, 35, 45 and 55 pound bumpers are 85 sHA. SuperStrap Collars: If you're tired of your barbell collars backing off during a WOD, SuperStraps will be your new faves! Especially for workouts where there are weight changes on the barbell, and for anything that requires frequent dropping of the bar (Grace, anyone?) You can pay more for fancy collars, but these are the best you need for garage gym and box use alike.